The 11 Gallon SwingTop Wastebasket is an ideal solution for all spaces in the home or office and integrates functionality with a simple, elegant appearance. The removable dual action swing-top lid conveniently swings down for quick, hands-free access. The unique design of the lid makes opening the wastebasket easy, and the lid will stay open for disposal of oversized items. The slim profile is ideal for use in the kitchen and is perfect for tight spaces, yet offers a generous 11 gallon capacity. 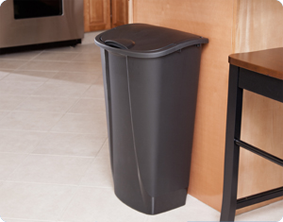 This wastebasket is designed to accommodate standard 13-gallon trash liners without interfering with the swing-top function. The overall dimensions of this item are 15 3/4" L x 12 3/8" W x 25" H.
Overall Assembled Size: 15 3/4" x 12 3/8" x 25"
Ideal for use in kitchens. 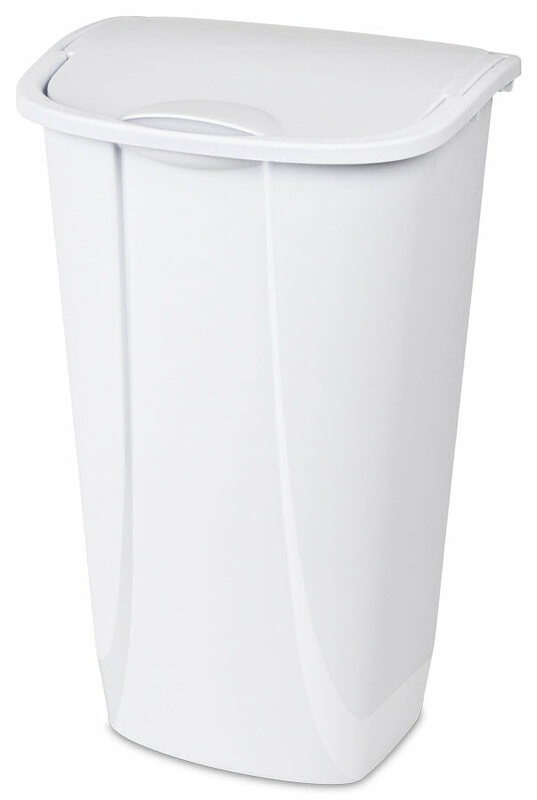 11 Gallon SwingTop Wastebasket is rated 2.3 out of 5 by 7. Rated 5 out of 5 by Jamimichele3 from Basic Trashcan We have 5 of these trash cans. They started out as one trash and 4 recycling bins, but have had different functions in our house during their lifespan. I recommend these trash cans because they are slim, so having a few lined up works well for recycling, they are lightweight but also sturdy when they are full. We rarely used the lids with these cans. I do remember them catching drips and always looking dirty. Since we kept them in a laundry room or a garage, we chose to forgo the lids. The slim size of these cans, combined with their inexpensive price make them a great for organizing things like recycling, extra trash bags, hoses during the winter, and wrapping paper. Rated 1 out of 5 by talkspot from Horrible Design Purchased this to replace my last trash can by Sterilite. This trash can is not worth the money even if it is free. The lid falls to the floor every time you flip the cover up to throw trash in. Even without a trash bag in it, the lid doesn't stay on. Once you put a trash bag in it, the lid won't stay on. It just flips off and fall on the floor. Terrible design. Don't buy. Rated 1 out of 5 by MisterLuke from Design flaw! I don't know how you managed to mess up a trashcan but it happened. I'm so disappointed that I made an account just to write a terrible review. The lid doesn't work well at all and reduced space needed to put trash in by 1/2! The same lid mechanism is also in the way of bags. The indent for the lid takes away the wraparound space needed by trash bags. This causes the bag to slide into the can and dismantling the lid in the process. Can't get rid of lid because the bag won't stay on without it. Please advise on my new trashcan i expect to receive free of charge. Rated 5 out of 5 by nicestuff from versitile, lightweight and strong Sure it is a great trash can, but we use them for laundry baskets. leak-proof, light weight and so easy to clean and sanitize. these are the perfect answer for kitchen, bedroom or work shop. laundry just passes right through the lid, and it is out of sight and smell. Then clean and sanitize with anything from bleach water to commercial cleaners, nothing seems to hurt it. and you are ready for the next load. These things are awesome. Rated 1 out of 5 by Mae from This product was a waste of money. You CAN NOT find a trash bag to fit it. If you put a trash bag over the top the lid DOES NOT work correctly. I have tried several different brands and kinds of bags and none will stay over top. I have tried 11 and 13 gallon bags. Rated 1 out of 5 by EJF from Does not function Looks great and all, but this trashcan is just a $9 mistake because you can't put liners in it and have a functioning lid. Very poor product design. Lid does not function. Rated 2 out of 5 by Kristin from Great Idea.... Poor Functionality I really liked the slim design and proposed functionality of the product! I was excited to put it in use. However, it is difficult to wrap the trash bag over the edge of the can and still utilize the swing top feature that it is advertised for. The trash bag gets in the way.